So I am in Michigan visiting my daughter and staying in my parents - now empty - home by Lake Michigan. A chance to rest, enjoy the green and the water - peace. 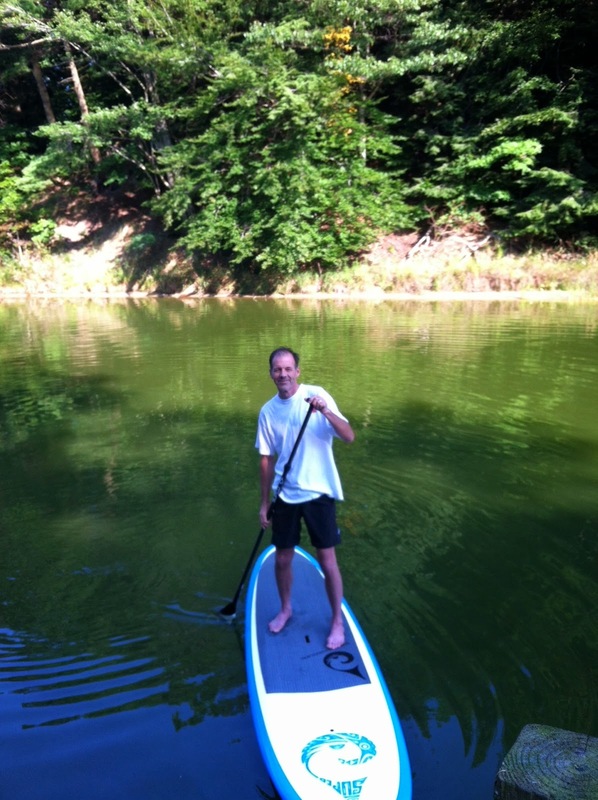 My brother has a couple of Stand Up Paddle Boards that I have been using each day. Both early in the morning and later in the evening as the sun goes down I paddle up the channel and out into Lake Michigan - an escape into stillness, gliding along untethered, unhindered, just the splash of the paddle and the coolness of the water washing periodically over my feet. But - each time as I get started - there has been an intrusion - a breaking in upon my mind and heart - a wave of worry and anxiety - unlooked for, unwelcome, but all very real and difficult to shake. I have always considered myself to be fairly free of anxiety - to be good at "be anxious about nothing" but in truth I just cover it up and bury it in busyness - so it is there, remaining and having its impact while I go on deciding to believe all is well in my soul. I am not sure if we can ever just stop being anxious but I do know that I can hand it over to Jesus, to have Him come alongside and carry it for me - and the first step towards that is to face it, call it out, see it there weighing upon my heart. So off I go paddling along and in that still place of quiet and solitude the worry comes - as it always does when I fist go to places of solitude - but as I keep paddling along and the worry is unmasked and revealed - I can then hand it over or more often see the Lord take hold of it for me. The troubles don't always go away but the anxiousness gets lifted and my board glides along more peacefully. Soon I begin to notice more along the way - the Canadian Geese and their little ones, the Crane hiding along the shore, the fish skirting under my board, the glimmers of sun reflecting on the water, the rest that comes when I remember Jesus is bigger and even more present than any sadness, or care or hurt and uncertainty. And there it is again - the door to renewal, rest, peace and life comes through a pathway of quietness, and time and space and pulling away - not always comfortable at first but always reviving at its conclusion. My mind is too blown by the fact that your daughter is old enough to live away from home now to adequately process the rest of this entry.